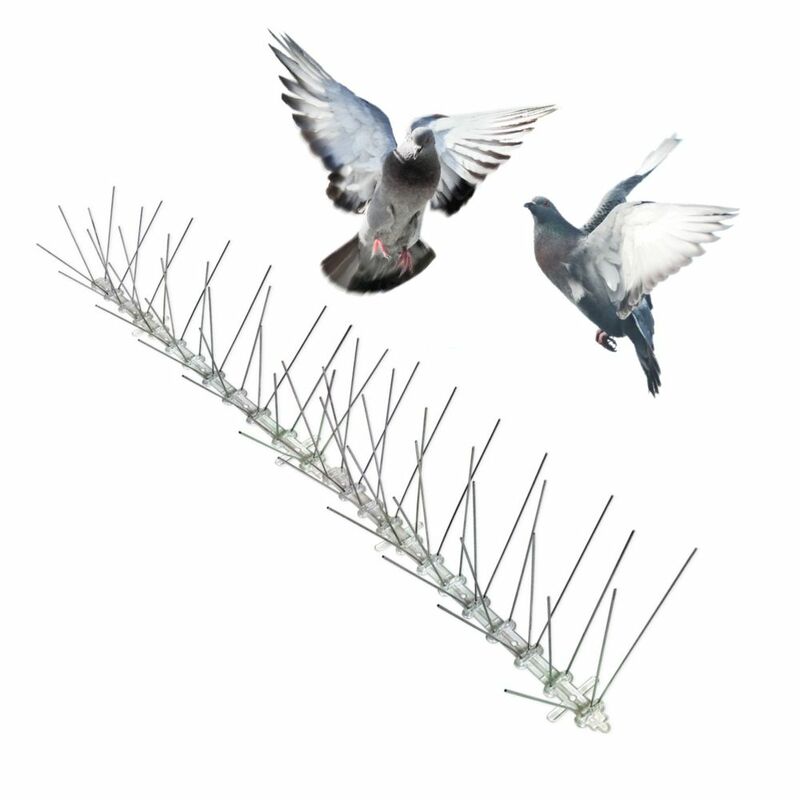 Block pigeons and other birds from their favourite landing and roosting surfaces with Bird-X Stainless Bird Spikes. Tough, long-lasting polycarbonate and stainless steel material provides maintenance-free bird control. Stainless Bird Spikes won't mar the look of a building. The spikes function as a 'keep-out' sign for birds. Flexible polycarbonate base allows mounting on most surfaces and is easy to install with adhesive (not included). Each section of spikes covers one linear foot, and a "spread" or width of up to 4.5 inches. Control birds such as pigeons, sparrows, starlings, crows, blackbirds, grackles, seagulls, swallows and more. Ideal for ledges, beams, rafters, ralings, air conditioners, signs, windowsills, gutters, roof perimeters, chimneys, support structures, awnings, poles, lights, statues, trusses, building projections and anywhere else birds roost. 100 feet per box. Stainless Bird Spikes 100 Foot Kit Guaranteed Bird Repellent Control #1 Best Seller Block pigeons and other birds from their favourite landing and roosting surfaces with Bird-X Stainless Bird Spikes. Tough, long-lasting polycarbonate and stainless steel material provides maintenance-free bird control. Stainless Bird Spikes won't mar the look of a building. The spikes function as a 'keep-out' sign for birds. Flexible polycarbonate base allows mounting on most surfaces and is easy to install with adhesive (not included). Each section of spikes covers one linear foot, and a "spread" or width of up to 4.5 inches. Control birds such as pigeons, sparrows, starlings, crows, blackbirds, grackles, seagulls, swallows and more. Ideal for ledges, beams, rafters, ralings, air conditioners, signs, windowsills, gutters, roof perimeters, chimneys, support structures, awnings, poles, lights, statues, trusses, building projections and anywhere else birds roost. 100 feet per box. Stainless Bird Spikes 100 Foot Kit Guaranteed Bird Repellent Control #1 Best Seller is rated 4.3 out of 5 by 6. Rated 4 out of 5 by Arturo from Good choice over other similar products.... Good choice over other similar products. Rated 3 out of 5 by Supermaint from Does the Job! If the plastic spine were metal I would give it 4 to 5 stars. I don't mind paying a little more for a superior product. I am afraid the UV may break down the plastic over the course of a few years... we'll see.